Back from our most recent cruise trip, we thought we would share our personal impressions of Champagne High Tea for-a-fee at sea for a single afternoon as compared to an elite tier loyalty program Elegant Tea at sea. The Champagne High Tea appears to be slightly more elaborate than the now discontinued part-of-the-cruise-fare High Tea used to be onboard. 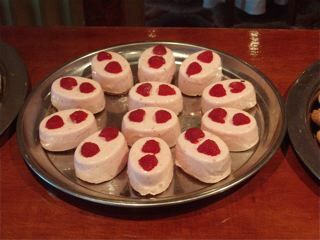 Champagne High Tea is offered to any cruise guests booking it in advance of the afternoon seating in the specialty European inspired cover charge restaurant onboard the ship. Modeled after the elaborate offerings from the Ritz Carlton Hotel in London, England, the for-a-fee High Tea is designed to feature live music by say a string trio or quartet. It starts off with a glass of Perrier Jouet “Belle Epoque” champagne from Epernay, France, served with fresh strawberries. That is then followed by your choice of 7 high quality Tea Forte tea company (a favorite of Oprah Winfrey’s) loose teas including Bombay Chai, Earl Grey, English Breakfast, Lapsang Souchong, Orchid Vanilla, Green Tango, and Camomile Tisane, or the Cafe al Bacio coffee from the Lavazza coffee company of Torino, Italy. 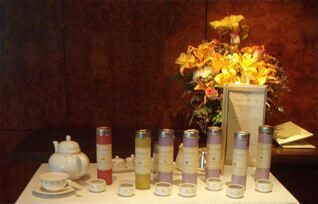 Some teas from Tea Forte are blended with fruits, herbs, and flowers. You can see examples of these on their website. The maître d’hôtel for the specialty restaurant noted that the loose tea needs to be allowed to expand and staff are careful to pay attention to that for High Tea service. You are welcome to refer to a previous blog post earlier this month on the subject of tea with some relevant details that echo that approach. 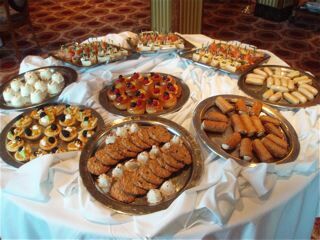 Additionally, a variety of items are served from a tiered, rolling dessert cart. 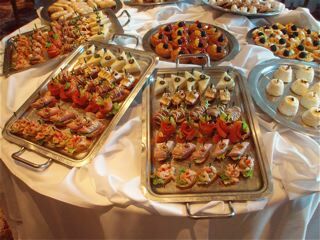 Those items include finger sandwiches (such as cucumber; tomato and mozzarella; smoked salmon (lox); chicken w/sun-dried tomato; egg; and roast beef), and then various pastries & scones. The pastries include: Sable breton pistache fraise; English fruit cake; Salambo Grand Marnier; dulce de leche Napoleon; Chocolate Florentine; and assorted macaroons such as pistachio, vanilla, and chocolate). Freshly baked, warm, honey raisin scones are served with strawberry jam and clotted Devonshire cream imported from England. Finishing the offerings are two kinds of homemade truffles (truffle cognac and truffle hazelnut as served for the Captain’s formal night toast in the Celebrity Theatre) and pâtes de fruits (specialty French fruit jellies as served for dessert on a tiered tray for final formal night at dinnertime). An alternative Elite Elegant Tea is now offered once per single week sailing to top tier loyalty level guests onboard the ship as a perk. The first week it seemed more put together than the second week and the photos are from the first week. Trays of various finger sandwiches, petit fours, etc. are served by wait staff strolling through the specialty restaurant, while a pianist plays relaxing music in the background. 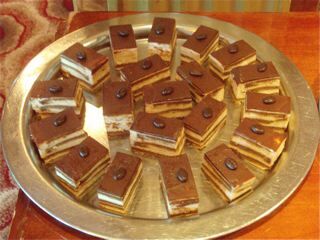 You can choose from, for example, moist Austrian (chocolate) Sachertorte, lemon or raspberry mousse, cream filled pastry cigars, eclairs, cannoli, fruit and cheese tarts, layered napoleons, coconut macaroons, various other freshly baked cookies, and even freshly baked scones served with whipped cream and strawberry rich jam. The tea will be bag tea in this instance from Mhai Diva or decaf from Bigelow (IMHO choices from Stash or Celestial Seasonings would have been better options if loose tea cannot be served). Note that the finger sandwich as well as the pastry options can vary from week-to-week. All the offerings are freshly made, and those we tried were delicious (obviously, one can only try up to a few items and not everything being served). Although the food quality was fine, I admit to preferring the former full High Tea atmosphere option with additional musicians (trio or quartet) and full white glove service with the full rolling buffet carts, etc, but the staff are clearly trying to make this an elegant event, even if it is not up to the higher ambiance standards of years gone by. Although definitely still more elegant than simpler Afternoon Tea, we found the informality of service was only a little more elaborate than Afternoon Tea and we missed the more elegant touches of true High Tea. 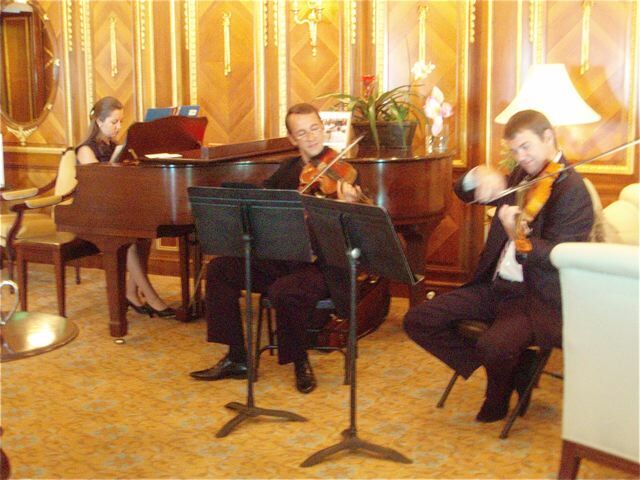 In 2010, we had been on another ship in the fleet and the Expression Trio played in the Olympic Restaurant for the Elite Elegant Tea (the French Walnut wood paneling in there is from the “A La Carte” restaurant that was on the sister ship to the Titanic, known as the Olympic). Below is a memory photo from that trip for comparison purposes to this trip with a single piano player of shall we say less classical background.